If there were any justice in the world, Ichiro would have beaten out the slow roller to shortstop in the eighth inning of Thursday’s game against the Oakland A’s in Tokyo, as he did so many times. But, of course, if Ichiro could still do that, could still place the ball at his discretion, as his former batting coach, Paul Molitor, was convinced he would do, he wouldn’t have been trotting off the emptied field in Tokyo for the final time moments later. Ichiro always was a master of timing, and he got it exactly right at the end, when it mattered most, by retiring after Thursday’s game. Oh, his stock line was always that he was going to play until he was 50 – at least – but when I pressed him about that once, he said he had no doubt he would be physically able to perform at that age, and beyond. “Mentally is where I think it can be rough,” he replied. I’m convinced Ichiro simply couldn’t come to grips with not being great. Yes, it’s true he has not been great for quite a while, and you could make the case he hasn’t even been good for a few years now. But in his supreme confidence, honed nearly from infancy, Ichiro always thought he could be again, with the right training, the right preparation, the right mind-set, the right opportunity. 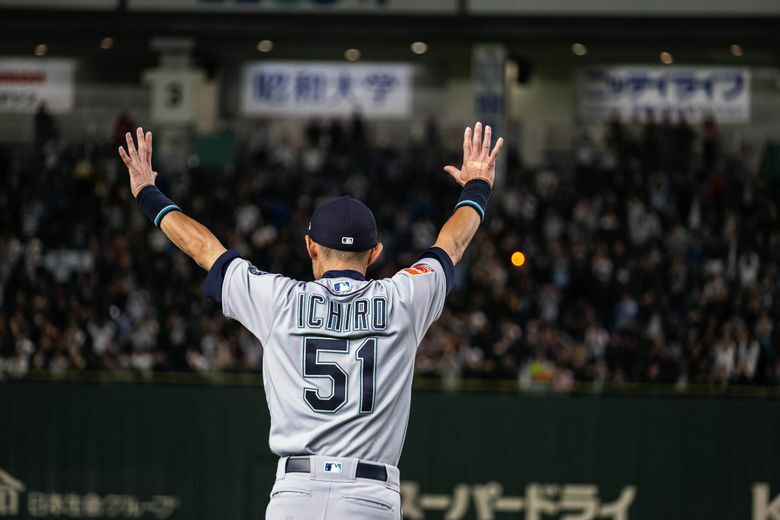 But this spring, Ichiro has had to wrap his mind around the fact that his greatness as a ballplayer is irretrievably lost – the hardest concession a supreme athlete will ever have to make. And, to get a little less esoteric, with the fact that he had run out of teams, at least in MLB, willing to wait. It was only then, freed of that burden to chase his past exploits, convinced finally it was a futile pursuit, that he could walk away. And he did it, amid all the pageantry at the Tokyo Dome, with a sense of contentment that I thought shined through the television screen. Ichiro got his moment on Thursday, in the wee hours back home in Seattle, as few ballplayers in any sport ever have. Japan, a country that reveres him beyond comprehension, showered him with love, while peers who admire him unconditionally did the same. The Mariners’ players lined up to greet him as he trotted off the field, while the A’s applauded from their dugout. From the standpoint of emotional wallop, it was perfection. The tears of Yusei Kikuchi and Dee Gordon were mirrored in many a living room, I’m quite confident. The last person Ichiro reached in the hug line was, appropriately, Ken Griffey Jr., another Mariners icon. I had to wonder what Griffey thought of this outpouring, having chosen a starkly different way to end his career, in solitude and unmarked. Like Griffey, Ichiro at times found his fame, particularly in his homeland, to be out of proportion and stifling, which is why he took such delight in the relative anonymity he was afforded in the U.S.
Of course, that changed a bit as he made his mark with the Mariners. He was such a singular talent that baseball fans watched with mouth agape as he showed a new way to play a century-old game. At the plate, on the bases, in the field, it was as if Ichiro was rewriting the rules. Ichiro’s sensibilities were a revelation as well. His father, Nobuyuki Suzuki, was a practicing Buddhist who believed that all inanimate objects, including baseball gloves and bats, are animated with a spirit. Ichiro’s nearly maniacal devotion to his equipment – which led him to a grudge against a former Mariners coach who treated roughly the gloves Ichiro had painstakingly placed on the bench – showed he was of the same mind. In his book, “The Meaning of Ichiro,’’ author Robert Whiting described the arduous practice sessions that Ichiro and his father would undertake virtually every day, starting when he was a young child. The sessions often wouldn’t end until 11 p.m., when Nobuyuki would massage Ichiro’s feet before bed. Mr. Suzuki once fired balls in anger at Ichiro, Whiting wrote, when he sat down on the field in protest of not being allowed to go play with friends. Ichiro batted away the balls, which Nobuyuki interpreted as a sign of superior reflexes and confirmation of his son’s athletic gift. “He would stand in the freezing winter and watch every practice, the only guy in the stands, taking notes, refusing to sit down because his son couldn’t sit down, refusing to eat or drink because his son couldn’t eat or drink,” Whiting told me in an interview in 2004 – the year Ichiro set the all-time season hits record with 262. In that goal, of course, he succeeded beyond the wildest dreams of anyone except perhaps Nobuyuki Suzuki. The meaning of Ichiro? He was a pioneer, an artist, a master craftsman, an innovator, an entertainer and a maverick. He was an icon and an iconoclast. He was a ballplayer – unlike any we’ve seen, or will see again.